We have a couple of new books in the store which might be of particular interest. West Philly resident Daniel Hunter has just released Building a Movement to End the New Jim Crow: An Organizing Guide, designed to accompany Michelle Alexander’s The New Jim Crow: Mass Incarceration in an Age of Colorblindness. We have copies of both, and also of Hunter’s earlier book, Strategy and Soul, about the local fight against the casino interests. 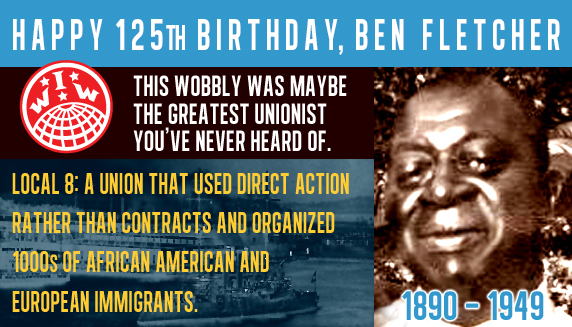 Monday, April 13, is the 125th anniversary of the birth of Philadelphia IWW organizer Ben Fletcher. Bindlestiff Books carries Peter Cole’s history (Wobblies on the Waterfront) of Marine Transport Workers Local 8, the first integrated dockworkers union in the United States, which Ben Fletcher helped found, as well as Ben Fletcher: The Life and Times of a Black Wobbly: Including Fellow Worker Fletcher’s Writings & Speeches. Bindlestiff Books will close at 3:30 on Saturday and be closed Sunday for the Easter holiday. We will resume regular hours Monday.